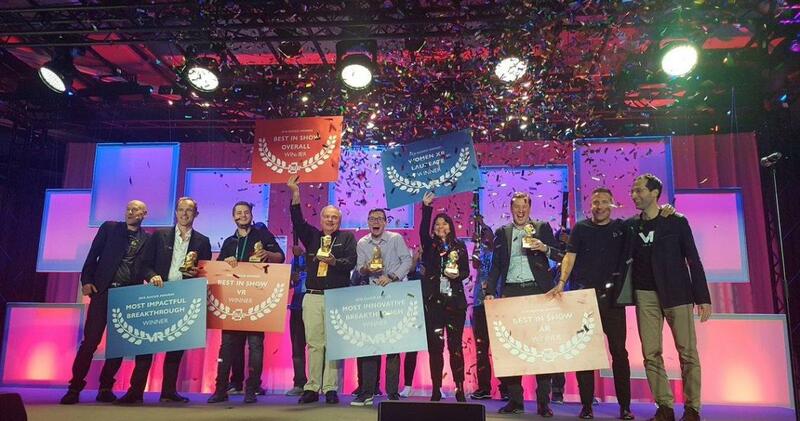 NJIT's John Vito d’Antonio-Bertagnolli and Tara Alvarez (fifth and sixth from left) share the stage with other winners at the 2018 Augmented World Expo Europe. An NJIT-led team of engineers, game designers, artists and clinicians won two major international awards for its vision therapy platform, including “most innovative breakthrough,” at the 2018 Augmented World Expo Europe (AWE EU), the leading industry conference for augmented reality technology. The competition pitted NJIT against 114 teams from design programs at MIT, Caltech, NASA and other leaders in the field. Sponsors of the award, announced in Munich before hundreds of designers, CEOs and investors from the sector, also include the global engineering organization IEEE and VR First, the virtual reality educational outreach organization. Alvarez, the lone woman standing on the confetti-strewn stage, also won the “Woman Laureate” award, which recognizes project leadership skills. The NJIT project, VERVE (Virtual Eye Rotation Vision Exercises), employs virtual reality games to correct an eye motor disorder called convergence insufficiency, in which the muscles that control eye movements do not coordinate to focus on near objects. Because each eye sees images separately, the person experiences double and blurred vision, headaches and difficulty concentrating. The impact on cognition and learning can be severe, particularly in children. The device, which has potential as a biomarker for concussion, is being tested in children’s hospitals across the country, and Alvarez and her alumni NJIT students have started a company, OculoMotor Technologies, to commercialize it. Alvarez is the company's chief scientific officer, Mitchell Scheiman, O.D., Ph.D., of Salus University, is the chief clinical officer and John Vito d’Antonio-Bertagnolli '16 H MS '17 and Chang Yaramothu,'13 MS '14 Ph.D. '17 are CEO and chief technology officer, respectively. Their collaborators and backers include Salus University, Children’s Hospital of Philadelphia, New Jersey Health Foundation and the National Science Foundation. "These therapies have not evolved much since the 70s, and while they're very good, they're incredibly boring," noted Alvarez, founder of NJIT’s Vision and Neural Engineering Laboratory. "We hope to address that by creating virtual reality games that are going to be done correctly because of the equipment, and they'll be fun so people want to do them." AWE EU shared the meeting space in Munich with IEEE’s annual ISMAR (International Symposium of Mixed and Augmented Reality) conference, billed as the leading international academic conference in the fields of augmented reality and mixed reality. The expo floor featured flashy demos from big companies like Bosch, as well as an expansive "startup alley" showcasing new projects. “The Auggie Awards are a validation of the tremendous progress the team has made in melding skills from multiple disciplines – engineering, information technology, digital design – to address critical vision disorders using AR/VR technology,” noted Judith Sheft, associate vice president for technology development at NJIT and co-principal investigator of the campus-based I-Corps program, who has worked with the team to incorporate customer insights into its device and to develop a robust business model to deploy it. The team’s diagnostic machine integrates two devices – a functional near-infrared spectroscopy (fNIRS) imaging machine and a video-based eye-tracking system – that together detect how changes in brain activity following an injury, including a mild concussion, correspond with changes in eye movements. Strapped to the head, the fNIRS machine uses light beams to measure blood oxygen levels – indicators of neural activity – in different regions of the brain. An ocular device Alvarez has created, known as a Vision and Neural Assessment Equipment system, measures eye movements and accommodation – the ability to see images clearly, which are promising biomarkers for neurological functions such as visual attention and memory. “My son, Christian, has taught me the importance of play, and my daughter, Ari, has showed me how to be more compassionate towards others. These lessons are deeply integrated in the philosophy with which I lead my lab and the way John, Chang, Mitch and I lead our company, OculoMotor Technologies,” she said. Yaramothu said the team was energized by the conference. "We are looking forward to continuing this work to ensure that our technology reaches the patients who need it," he said.